The Nativity of St. John the Baptist or his birth is a Christian Feast Day celebrating the birth of John the Baptist, a prophet who foretold the coming of the Messiah in the person of Jesus, and baptized Him. 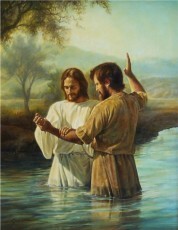 Christians have interpreted the life of John the Baptist as a preparation for the coming of Jesus Christ, and the circumstances of his birth, as recorded in the New Testament, are miraculous. The sole biblical account of the birth of John the Baptist comes from the Gospel of Luke. John’s parents Zechariah – a Jewish priest, and Elizabeth, were without children and both were beyond the age of childbearing. During Zechariah’s service in the Temple in Jerusalem, the Archangel Gabriel appeared to him and announced that he and his wife would give birth to a child, and that they should name him John. Because Zechariah did not believe the message of Gabriel, he was rendered speechless until the time of John’s birth. His relatives wanted to name the child after his father, but Zechariah wrote, “His name is John”, and immediately he could speak. Following this obedience to the command of God, he was given the gift of prophecy, and foretold the future ministry of John. When Mary the mother of Jesus journeyed to visit Elizabeth, Luke’s Gospel recounts that the baby “leapt” in Elizabeth’s womb at the greeting of Mary. As Christians, we know this is John’s first act of prophecy. The Nativity of St John the Baptist is one of the oldest Feasts of the Christian church, being listed by the Council of Agde in 506 as one of that region’s principal Feasts, where it was a day of rest and, like Christmas, was celebrated with three Masses: a vigil, at dawn, and at midday. The Nativity of St John the Baptist on June 24 comes three months after the celebration on March 25 of the Annunciation, when the Archangel Gabriel told Our Lady that her cousin Elizabeth was in her sixth month of pregnancy, and six months before the Christmas celebration of the birth of Jesus. The purpose of these Feasts is not to celebrate the exact dates of these events, but simply to commemorate them in an interlinking way. Celebrating the birth of St. John the Baptist is a Feast that is relevant to all of us today. Just like St. John, we would do well to “leap” with joy in announcing Jesus to all those we encounter in our world. We can do this in everything we do – not just by words, but by actions. Asking for St. John’s intercession on this the Feast of his birth, we can draw the strength necessary to proclaim our Lord to others.